Fatigue, deformation and degradation of materials, high-temperature behavior of materials, application of mechanics and materials to structural failures, and fracture mechanics. Dr. Antolovich's work experience has been varied and is outlined below. Dr. Antolovich’s major research interests have been in the areas of deformation, fatigue and fracture, especially at high temperatures. His current projects include experimental work and theoretical development of life prediction models for thermomechanical fatigue (TMF). 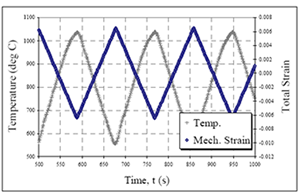 As depicted in the accompanying figure, Dr. Antolovich’s group is currently studying thermomechanical fatigue (TMF) in which temperatures and strains vary simultaneously and independently. Such conditions occur in jet engines. This work is being carried out to enable engineers to make better predictions of how long components will last. 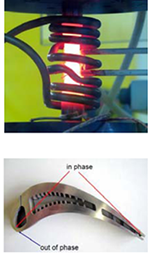 Experiments are carried out in our labs (upper right) to simulate simultaneous changes in temperature and strain (lower left) that are encountered in actual just engine components such as the turbine blade shown in the lower right. These experiments form the basis of models that we are developing to better predict the life. Dr. Antolovich is the author of more than 100 archival articles in leading technical journals and books, and he has made more than 100 presentations to learned societies in the U.S., Europe, Canada, Korea, and Japan. Dr. Antolovich’s research has been funded by numerous government agencies, including NASA, Air Force Office of Scientific Research (AFOSR), Wright-Patterson Air Force Base, the Office of Naval Research, NATO, the National Science Foundation, Sandia National Laboratory, and the Canadian Air Force. Companies funding his research include: Alcoa, GE, Haynes International, Georgia Iron Works, Southwire, Garrett, Cummins Engine, Pratt and Whitney, Northrop, and McDonnell-Douglas. Dr. Antolovich has also been a consultant to major industrial organizations such as Alcoa, GE, Allied Signal, Cummins Engine, Pratt and Whitney, Northrop, Satec Systems, Chromalloy, Oshkosh Trailers, and Balfour Beatty. behavior at locations in a blade that may lead to crack formation. OP cycle (graph), in-progress TMF experiment (upper right), turbine blade (lower right). A. Pineau and S. D. Antolovich. 2009. Fatigue a Haute Temperature, InLa Fatigue des Materiaux et des Structures. C. Bathias and A Pineau, Editors. Lavoisier, France,3, 19-155. S. D. Antolovich and K. Findley, 2009. A New Look at Attractive/Repulsive Junctions and Cleavage Crack Formation in BCC Materials. Engineering Fracture Mechanics 77, 201-216. E. Bayraktar, S. D. Antolovich and C. Bathias, 2006. Multiscale Study of Fatigue Behaviour of Composite Materials by X-rays Computed Tomography,International Journal of Fatigue 28, 1322-1333. S. D. Antolovich and A. Saxena, 2002.Thermomechanical Fatigue: Mechanisms and Practical Life Analysis. ( W. T. Becker and R. J. Shipley, Editors)ASM Handbook 11, Faiture Analysis and Prevention, ASME International, Materials Park, Ohio, 738-745.